If you’ve been following us on Twitter lately, you might have noticed we’ve been talking about diets a lot lately. Not losing weight diets (although that is often the result), but diet as in the types of food we’re eating, or in this case not eating. 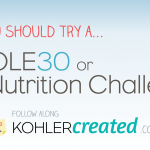 Just a few years ago we made the move to eliminate junk food and frozen meals from our diet. At the time it felt like a huge sacrifice to part ways with Doritos and my favorite snacks, but when I look back at my cool ranch days, I don’t know how I ever lived that way. Now we’re ready to make another change, to hopefully remove most of the processed foods still in our diet. We’re going Paleo, slowly. I think it’s important to state up front that we know this will not be a 100% perfect endeavor, nor will it happen overnight. Neil and I love food, and as life is short we intend to still enjoy the things we love (like pizza, beer and chocolate), just on the weekends and in moderation. The beginning of our goal is to change the way we eat during the week, when we’re heavily structured and substitutions and a few ingredient swaps are easy. Friday nights and Saturdays will be our time to “cheat” and enjoy a few of our favorite things, always in moderation. So when are we starting? Well, we’re just about halfway through week 2 and we are already noticing changes. Neil has dropped weight and a lot of the symptoms that I thought were part of my Endometriosis are almost completely gone. I thought I’d commit a felony without cheese in my diet, but so far I feel GREAT. I think it’s becoming clear that I am more lactose intolerant than I thought. I think what I love best is that the food we’re eating fills us up without knocking us out. We can go running easily about an hour after eating and I’m noticing I’m a lot less groggy after I eat. This is actually the first recipe we tried on the diet, and although it’s a little meaty, can easily be substituted and adjusted to include more vegetables. 1. Clean and discard the thick stems of cauliflower. Chop into “rice” sized pieces. The smaller you chop, the more it sticks to chicken. 2. Combine soy, ginger and heat oil in large non-stick sauté pan, pour in beaten egg, swirl to thin the egg layer. Cook for approximately one minute. Remove from pan, chop and set aside. 3. Over med-high heat (same pan) add the chicken breast, sear on one side. 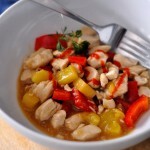 Without turning chicken, add 1/2 cup of water wait until water is reduced to almost nothing. Flip chicken breast, allow to sear on other side. Repeat with 1/2 cup of water, flip as needed until the chicken is cooked through. Remove and chop into bite-sized pieces then store in a covered bowl. 4. With the same pan and the glaze leftover from the chicken, add the cauliflower. The natural juice from the vegetable will deglaze the pan as the veg cooks. Stir for 1 minute over medium-high heat and add 5 spice powder. Stir for an additional 1 minute then add the soy mixture. Stir to combine. 5. 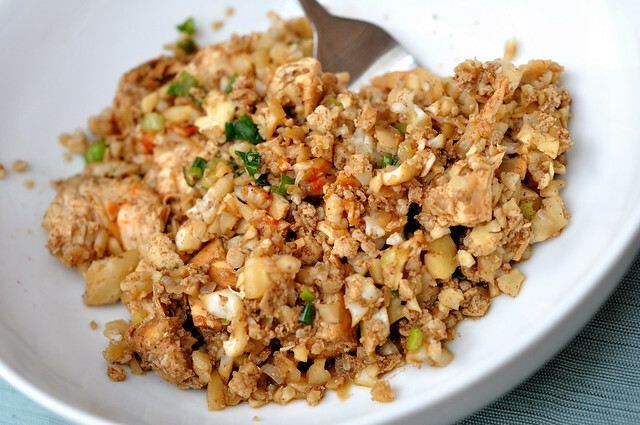 Add chicken and egg to cauliflower and stir for 2-3 minutes. 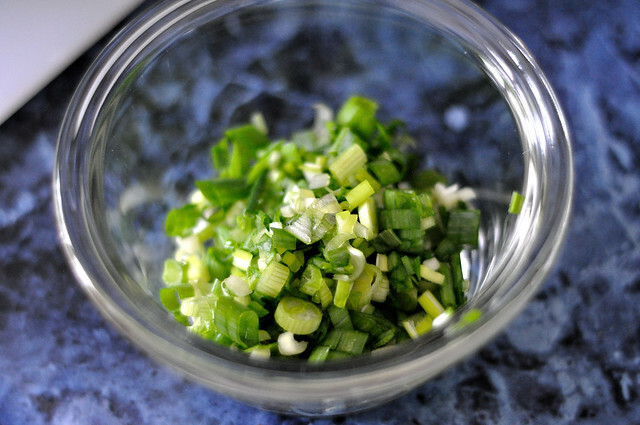 Top with chopped green onions and serve. What I love about this recipe is that a little goes a long way. We were both full after eating about a cup and a half, leaving us plenty leftover (we doubled the recipe), which saves us $$ and time spent cooking we’d rather spend outside in this amazing weather. 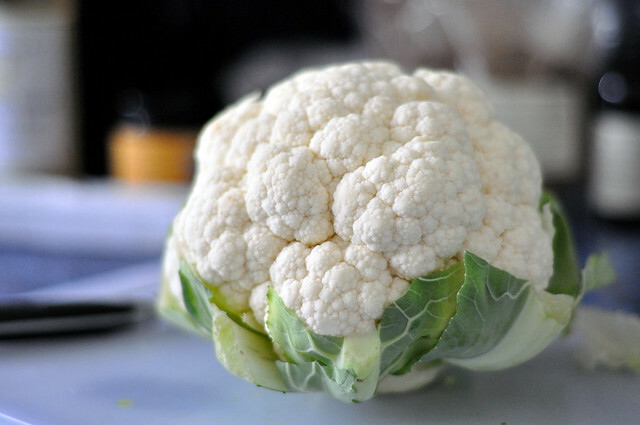 Cauliflower is one of those veggies I’ve always overlooked because I only tend to see it on veggie trays. Crumbled, it’s the perfect substitute for the much loved comfort-food sticky rice texture, and it keeps the meal so much lighter. Also, if you haven’t yet tried five-spice powder, make it a kitchen staple ASAP. It makes seasoning Asian-themed dishes easy and delicious. It looks delicious and yes amazing how food affects how we “feel.” Glad you are feeling better. Nice trade off I’d say. btw…. I like the fact that you are allowing for some cheats on the weekends. I think the only way we’ll make it is if we cheat a little on the weekends. Life is short, and we just don’t see staving off death for a few extra years worth a lifetime of doing without some of the foods we love. We’re going to find the right balance that keeps us feeling better and happy without feeling deprived or left out! I totally needed this post right now! I’ve been researching (and stressing) about making better food choices for awhile now, and we haven’t done a great job at taking those first steps. Looking forward to reading more about your progress with it! We have a hard time without having some kind of plan and things that are on and off limits. We’re hoping Paleo offers enough variety, but adequate guidelines to help! I am SO EXCITED about this post! My husband is trying to loose weight and is trying paleo and I have been sucking at coming up with stuff to make. I’ve also been wanting to try it myself (just started doing crossfit and they are super into it there). 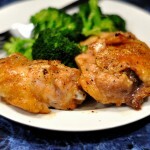 I hope you’ll share more paleo recipes in the future! I have about three drafted so you’ll see plenty of recipes with both paleo and somewhat-cheating ingredients. I’m so glad you’re following along, keep us accountable! Oh! 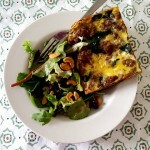 I’m designing a paleo cookbook for Melissa at theclothesmakethegirl.com – it comes out in December. You’ll have to check it out! Definitely! We’re exciting to be embarking on this, and to just look at food differently altogether. 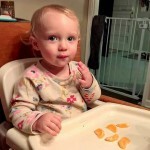 I’m intrigued by the Paleo diet! Obviously it wouldn’t work for me (it’s not exactly vegan friendly) but I like that it’s focused so much on whole, unprocessed foods. I don’t personally think meat is bad for you in moderation, being more of an ethical vegetarian myself. Plus it might be fun to try and veganize some of your paleo recipes. 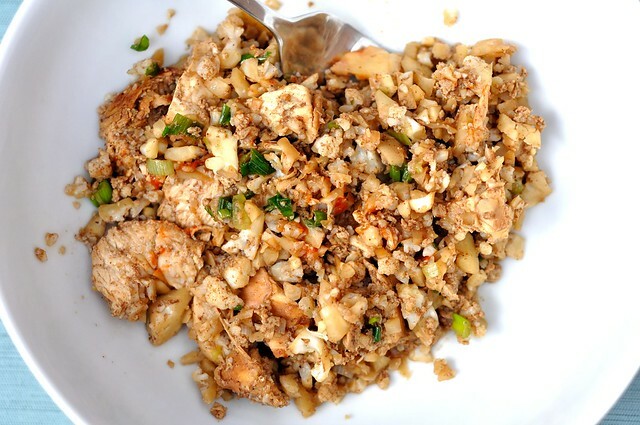 The cauliflower rice in this one looks really tasty! It was really tasty! I’m eating more lean meat so far in Paleo than I probably would like, so as time goes on and we get more comfortable, I might make some slight adjustments, but I think the central motivation was definitely to eliminate processed foods, and things we thought were good but are now realizing are not so good. I definitely think you’ll be able to veganize a lot of the meals pretty easily since cheese and dairy won’t be in there at all, and it’s really just subbing the central protein. Yay! SO happy you are giving this a try! I’m such a slow learner and couldn’t figure why I had so many stomach issues? Duh! Lactose intolerant and I have gluten sensitivity! When you get used to eating Paleo you lose those cravings for the bad stuff and learn to make substitutions, like Paleo Pizza made with Almond flour crust! Checkout “The Paleo Solution” by Rob Wolff or “The Primal Blueprint” by Mark Sisson. It is not a diet book but an educational book on what food does to your body, with the upside of losing weight. Enjoy the journey! Thanks sis! It definitely runs in the family because I thought I could still eat *some* dairy, but now that I haven’t had it in almost two weeks (aside from one coffee which was a MISTAKE), I feel so much better. Less bloat, less swollen, it’s amazing. I love that paleo offers plenty of ways to get around the bad stuff while still allowing you to enjoy a lot of food I love. We’re going to make it work. Thanks for the book tips, I’ll DL them tonight! Wow, that looks amazing! I’m bookmarking this — I plan on making it soon! 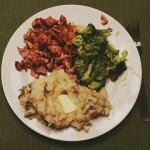 We’ve gone Paleo (or Primal, depending on who you ask) in the last 1.5 months and it’s made a world of difference. I’ve lost 13 pounds and my GERD symptoms are subsiding – alas, they are not gone. One difference for us is the inclusion of whole-milk pasture-fed dairy. If I’m giving up everything I love (pastry, pasta, bread) then I have to have something to keep me happy other than meat & veggies because I know that when I struggle with a diet I don’t stick to it. At all. By allowing ourselves dairy I’m able to stick to the diet very easily. That said, we allow cheats as well. For instance, I will still have a small glass of wine or a beer with dinner a couple of times a week. On the weekends, I will allow myself two glasses of wine with dinner, but I’m uber-diligent about grains and processed carbs. I think that’s the great thing about Paleo, it’s something that is structured loosely enough that you can make adjustments that are right for your body that will enable you to stay on track and not fall off because you are miserable. I tend to allow more carbs and stay more strict on the dairy (as apparently I’m pretty lactose intolerant). I think the key is to do less of what you know isn’t working and more of what you should be doing, and when done gradually and seamlessly with what your body is telling you it wants, it works.